Rumble strips alert sleepy and inattentive motorists that they are about to veer off the highway or into the opposite lane of traffic. But the grating noise that prevents collisions can also be annoying to nearby residents. Around Minnesota, more and more counties are facing push-back as they install shoulder rumble strips on roadways in populated areas. This is because county road shoulders are narrow — leading drivers to frequently hit the rumbles. “There is a strong concern statewide that these noise complaints will raise enough concern that legislation may be passed reducing their use,” said technical liaison Ken Johnson of MnDOT’s Office of Traffic, Safety and Technology. 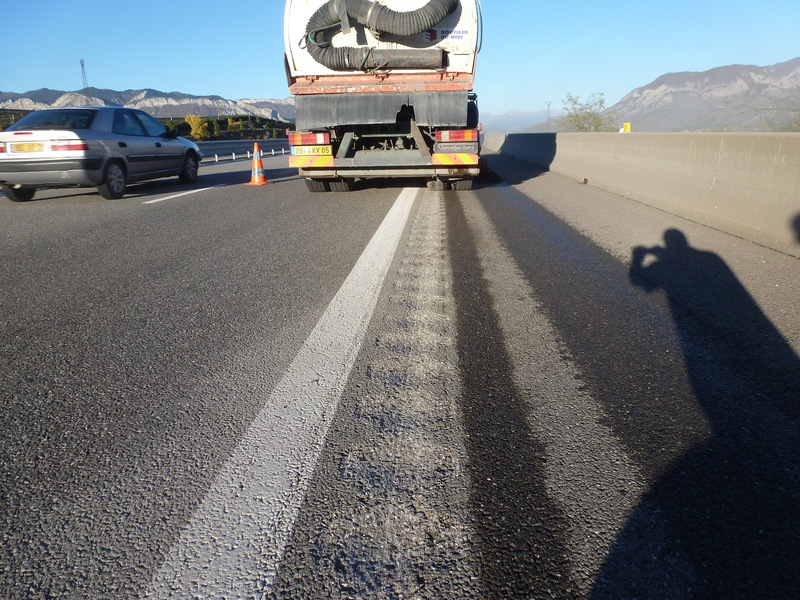 A European-developed style of rumble strip, called sinusoidal, could provide Minnesota a new means of warning drivers without as much stray highway noise. Rumble strips are patterns ground into asphalt that cause a vehicle to vibrate when its tires come close to the centerline or road edge. They help prevent lane departure crashes, which account for more than 50-percent of fatalities on the road system. The sinusoidal rumble (below) has a sine wave pattern ground into the pavement, while the traditional rumble strip (top photo) doesn’t follow a wave pattern. MnDOT’s Office of Traffic, Safety and Technology plans to test different designs of the Sinusoidal rumble strips to find the one with the highest level of interior vehicle noise and lowest level of exterior vehicle noise. The navigability of sinusoidal rumbles by motorcycles and bicycles will also be evaluated. The project was recently funded with a research implementation grant from MnDOT’s Transportation Research Innovation Group. If sinusoidal rumble strips are found to be effective, the chosen design will be used for centerlines and road shoulders in noise-sensitive areas throughout the state highway system. It is anticipated that counties will also adopt the design. Unlike counties, most of MnDOT’s recent complaints have been for its centerline rumbles, which are required on all rural, high-speed undivided roads in Minnesota, Johnson said. MnDOT has considered allowing more exceptions due to residential noise concern; however, doing so could result in more fatal and serious crashes. Sinusoidal rumbles are seen as a possible alternative for these noise-sensitive areas. The Local Road Research Board is also studying different designs of sinusoidal rumble strips in Polk County. Rumble strips are a more of a problem then a solution. They ruin many roads for bike riding. It is my observation they also cause the road surface to deteriorate faster because of the damage they cause to the surface. Get rid of them. The research is very clear that rumbles improve safety for the driving public. More than half of fatal crashes occur after a driver crosses the edge or centerline of a roadway (called lane departure crashes) – in fact, in the past 5 years, over 950 people have lost their lives due to a lane departure crash in Minnesota. NCHRP Report 641, Guidance for the Design and Application of Shoulder and Centerline Rumble Strips, has summarized the crash data and found that Rumbles dramatically reduce lane departure crashes. You assert that 950 fatalities could be avoided by rumble strips due to “lane departure”. This assumes all of these people were sleeping I guess. Lane departure happens due to speeding, drunk driving, animals in way , texting and other things like poor judgment. Wider ,flatter, safer just makes people drive poorer and faster. Waking the home owners constantly by installing these isn’t like moving next to train tracks . The tracks were there before. They are probably the most annoying thing anyone could do to a road. They just put them on hwy 71 here and it is pretty much impossible to be outside for more than 5 minutes without hearing them. Ive talked to people that live .5 mile away and they complain about them. GET RID OF THEM. I would bet that no big shot mndot engineers have rumble strips going in front of there place. The problem isn’t the rumble strips; it’s the drivers who aren’t paying attention and don’t stay in their lane. What is the set rule, how close to the white line,some are right next to the white line, while others are further away. They should not be allowed in passing zones on undivided roadways. My little piece of heaven along USTH 169 near Grand Rapids is in a highly used passing zone. 24/7 noise pollution.